Of SaddleBrooke’s many birds, probably the most fascinating are our hummingbirds. No other birds are so jewel-like, so tiny, so acrobatic or so aggressive. Hummingbirds can fly in ways no other birds can match: vertically, backwards and horizontally, as well as hover almost indefinitely. Their high metabolism, rapid heartbeat (as high as 1,200 beats per second) and wing beats (as high as 90 per second) require them to consume an enormous quantity of nectar and insects daily. Hummingbirds are thought to have originated in Europe, but today are found only in the Americas, from Alaska to Argentina. There are about 330 species across this range, and almost all of them are found from Mexico south. Only 17 species are known to have bred in the U.S. and Canada, and only one, the Ruby-throated, is regularly found east of the Mississippi. We are particularly fortunate in Arizona, where we can see 16 species, more than in any other state. I’ve documented 5 species here in SaddleBrooke, with a possible 6th on the “suspect” list. Our two most common hummingbirds are the Costa’s and the Black-chinned. 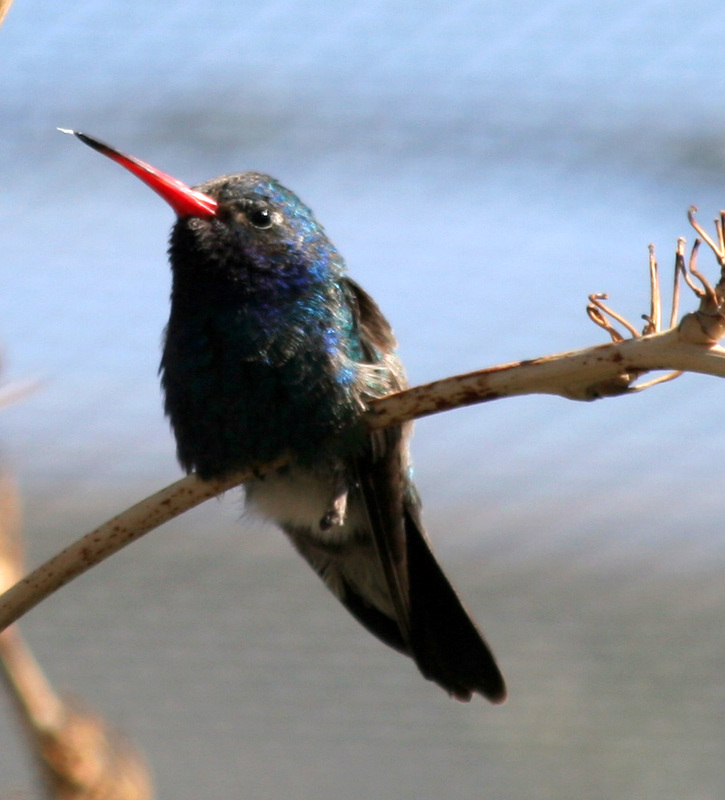 Although hummingbird colors can vary amazingly, depending upon light reflection, as a rule male Costa’s show a rich purple crown and gorget, and male Black-chinned have a black head and crown with a white neck band. The distinctive gorget on a Costa’s is similar to Yosemite Sam’s sideburns. Costa’s are our smallest hummingbird, and Black-chinned bills are longer than Costa’s. Both of these species are currently present in SaddleBrooke. The Costa’s can be seen here year-round, but the Black-chinned winter in Mexico. SaddleBrooke’s most beautiful and unmistakable hummingbird is the Broad-billed. The male has an iridescent turquoise head and crown, a blue chest, dark wings and an orange bill ending in black at the tip. Anna’s hummingbirds are present in Arizona year-round, but more commonly seen in the winter. Anna’s are larger and chunkier than Costa’s, and their tail extends beyond the wingtips, two ways to differentiate them. Male Anna’s have a bright red head and crown. The fifth documented SaddleBrooke hummingbird is the Rufous, and the male, with his bright copper-colored body, is unmistakable. You can look for Rufous hummingbirds in July and August, when they are migrating south. A sixth possibility in SaddleBrooke is the Broad-tailed, which has been documented in Catalina State Park. The male Broad-tailed has a brilliant hot-pink gorget, which contrasts sharply with a white breast (Anna’s breast is more gray). Broad-tailed hummingbirds also can be identified by a distinctive wing trill in adult males. This species can be observed closely at the feeders at Iron Door restaurant in Summerhaven on Mt. Lemmon. This entry was posted in Hummingbirds and tagged SaddleBrooke Hummingbirds. Bookmark the permalink. I love my humingbirds thet are fushia throated and head . a few ar orange in color. thet have be her in tarzana since february. are the green irresdesent one female.